William “Bill” Kenneth Catching Jr. passed away peacefully at The Sanctuary at Passages Hospice on Tuesday evening, March 14, 2017. He was six days shy of his 84th birthday. Beloved husband of Edith Degelos Catching of over 60 years. Loving father of Karen Faucheux (Dale), Georgia Harrington (Chuck), and Laura Hinds (Phil). Grandfather of Paul, Kenneth, and Andrew Faucheux; Caroline, Craig, and Douglas Harrington; and Jordyn, Billy, and Ross Hinds. Brother of Virginia Harris and Carol Denney. Son of the late William Kenneth Catching Sr. and Isabel Ainsworth Catching. Bill was a native of Hazlehurst, Mississippi, and moved to New Orleans to attend Tulane University on an ROTC Scholarship. After graduation, he served in the United States Navy as a Flight Schedules Officer. He and his wife Edith settled in Metairie where he retired as an independent insurance agent. 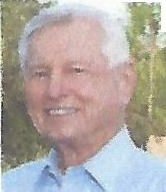 Bill was an avid golfer and member of Cypress Lakes Country Club. He will be dearly missed. Relatives and friends of the family are invited to attend his memorial service at Leitz­ Eagan Metairie, 4747 Veterans Memorial Boulevard, on Wednesday afternoon, March 22, 2017 at 1:00. Visitation will begin at 11:30 in the morning. Internment will be private in Garden of Memories. In lieu of flowers, contributions in his memory to Cancer Crusaders are preferred. An online guestbook is available at www.leitzea anfuneralhome.com.